Which Players Are Coming To The Cardinals Caravan? The St. Louis Cardinals Caravan is making its annual trip to Memphis and visiting AutoZone Park on Sunday, January 20. The event is slated to begin at 6:30 p.m. in the Champions Club on the club level. The program will offer first-come, first-served seating with doors opening at 5:30 p.m. Admission is free and the event will feature complimentary food and soft drinks. This year’s attendees include former Redbirds Matt Adams, Sam Freeman, and Brad Thompson. Former Memphis Chick and National League All-Star Ryan Franklin and Cardinals’ 2012 first round pick Michael Wacha will also join the Caravan along with broadcaster Dan McLaughlin. Players will discuss the past and upcoming season during a question and answer session with youth autograph opportunities to follow. The Cardinals will be implementing a new Autograph Ticket system this year. The first 400 kids (15 and under) through the door on the day of the event will receive a free Autograph Ticket which guarantees one autograph from each current and former player. Autographs will only be available for kids 15 and under. Adams enters the 2013 season ranked as the Cardinals’ #7 prospect by Baseball America. The 24-year-old batted .329 and belted a team-leading 18 home runs in 67 games at first base for the Redbirds last season while also making his Major League debut for the Cardinals. The Cardinals’ 2011 Minor League Player of the Year batted .244 with a pair of homers and 13 RBIs for St. Louis while filling in for the injured Lance Berkman. Freeman continued a successful comeback from Tommy John surgery in 2012, logging a 1.89 ERA between Double-A Springfield and Triple-A Memphis before making his Major League debut for the Cardinals in June. The southpaw concluded his breakthrough season by pitching in the prospect-laden Arizona Fall League and being named to the Rising Stars Game. Franklin spent the final five seasons of his 12-year career with St. Louis and was named to the 2006 National League All-Star squad. Franklin pitched for the Double-A Memphis Chicks in 1997 and currently serves as a special assistant to the GM in the Cardinals baseball operations department. Thompson, who pitched parts of six seasons with the Redbirds from 2004-09, primarily worked out of the St. Louis bullpen for five seasons and was a member of the 2006 World Series Champion Cardinals. Wacha enters the 2013 season ranked as the Cardinals’ #6 prospect by Baseball America after being St. Louis’ first round selection (19th overall) in the 2012 draft out of Texas A&M University. The 6-foot-6 right-hander posted a miniscule 0.86 ERA in 11 games across three levels in his first professional season and collected a Texas League Championship ring with the Springfield Cardinals. Favorite Color: Right now it’s royal blue. So it changes? How often does it change? If I see a color that I really start liking, I’ll just change it. If you weren’t in baseball, what would you be doing? Hopefully I’d be traveling around. If I had to have a job, I’d like to try and play tennis. Where do you see yourself in 25 years? On a lake somewhere with my family watching my kids grow up. Do you have any rituals? Drink a cup of coffee, hot tub, stretch and then pre-game high-fives. Best prank pulled that you’ve seen or been a part of while in pro ball? I saw a cop come into the clubhouse and fake arrest a guy for being out after curfew. Greatest memory since playing baseball: There’s so many…probably getting called up to St. Louis for the first time. Most embarrassing moment while playing baseball: Running all the way back into the dugout with only two outs. Can I have five dollars? Sure. If you were a drink, what kind of drink would you be? Water because I love it. That’s pretty much all I drink, it’s good for you and…I like to be good for people? Favorite play in a baseball game: Home run, it’s got to be a home run. The Arizona Fall League starts today out in the dessert and several other Winter Leagues are already underway. The Arizona Fall League is probably the most glamorous of all the Winter Leagues due to the fact it is normally a who’s-who of top prospects from all 30 MLB teams. Let’s just run down the list of who will be in Arizona for a few extra weeks of fun in the sun. Well the top two picks from this summer’s draft will be there with Stephen Strasburg (Washington Nationals) bringing his millions of dollars and 100-MPH fastball. No. 2 pick Dustin Ackley will be there representing the Seattle Mariners. Including Strasburg and Ackley, five of the first 10 picks from last summer’s draft are scheduled to be in Arizona. The Giants uber-catching prospect Buster Posey will be there. The Marlins are sending Andrew Miller in hopes of getting the big lefty back on track. The Kansas City Royals top prospect Mike Moustakas will play third for the Surprise Rafters. Former Ole Miss Rebel and Collierville, TN-native Zach Cozart will represent Cincinnati. And all those guys are just a few of the best, future big leaguers. So if this the best-of-the-best prospects league, who are the Cardinals sending? Since the Cardinals traded four of their Top 10 prospects from last year fans will definitely see some new, yet familiar faces wearing the Birds on the Bat while playing for the Surprise Rafters this fall. The players the Cards have slated on the Rafters Opening Day Roster are below along with their position and the highest level they reached in 2009. Gary Daley – RHP – Double-A Springfield – Daley pitched in just nine games, all in relief, for the S-Cards this past season going 0-2 with a 4.76 ERA. The right-hander didn’t make his debut until August 19 for Springfield after starting the year with Single-A Quad Cities, where he went 4-3 with a 6.93 ERA in 32 games, 10 starts. Daley was the Cardinals third round pick out of Cal Poly San Luis Obispo in 2006.
round pick of the Rays last year. Mike Parisi – RHP – Single-A Palm Beach – Former Redbird Mike Parisi will be one of very few guys in the Fall League with MLB experience. Parisi pitched in 12 games, two starts, for St. Louis in 2008 before blowing out his elbow in a game with Memphis at Sacramento in early August. The right-hander missed almost all of 2009 recovering from Tommy John surgery. Adam Reifer – RHP – Single-A Palm Beach – Reifer racked up 21 saves in 54 games for the Cardinals this past summer going 4-7 with a 4.47 ERA along the way. In his first full year of pro baseball Reifer followed up a stellar 2008 when he was tabbed the third-best prospect and best pitching prospect in the New York-Penn League after punching out 41 batters in 30.1 innings. 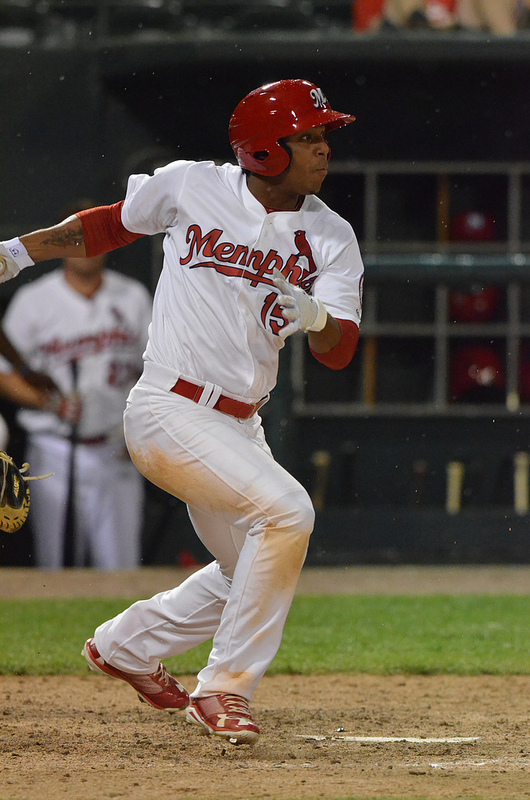 Bryan Anderson – C – Triple-A Memphis – Anderson is another former Redbird scheduled to get some extra at-bats in the Fall League after missing significant time due to an injury. Anderson was the ‘Birds starting catcher before going down with a shoulder injury sustained in a collision at the plate in late June. The California-native is still considered one of the Cardinals best prospects but needs to use the Fall League to vault into 2010. Daniel Descalso – 2B – Triple-A Memphis – The Arizona Fall League will be the icing on the cake to an amazing 2009 campaign for Descalso. After crushing the Texas League for a .323 average and 26 doubles in 73 games, Descalso was promoted to Memphis for 46 games before joining Team USA for their gold medal run in the World Cup. He’ll share the Rafters infield with Team USA teammate Ike Davis from the New York Mets organization. Tyler Henley – OF – Double-A Springfield – Henley just wrapped up the best season of his young career leading Springfield with a .303 average and 31 doubles in a career-best 123 games. The former Rice star hadn’t even played in 123 games in his two previous years as a pro until this past summer. Henley is on the taxi squad for the Rafters, which means he is only active on Wednesdays and Saturdays. Daryl Jones – OF – Double-A Springfield – Jones has been one of the Cardinals top prospects since he was drafted in the third round out of high school in 2005. However, since then his career has been up-and-down until 2008 when he was named the Cardinals Minor League Player of the Year. Jones will be making up some at-bats this fall as well after missing a lot of time in the second half of the season with a leg injury. Other former Redbirds playing ball this fall are Jon Jay, who is hitting .400 in four games for Leones del Caracas in the Venezuelan Winter League, and Fernando Salas, who has turned in 1.1 scoreless innings for Naranjeros de Hermosillo in the Mexican Pacific League. Naranjero translates to orange seller in case you were wondering. Follow us on twitter (@memphisredbirds) and check back here for updates on our Boys of Fall. You can also follow the Arizona Fall League games pitch-by-pitch over on MiLB.com. Games start at 1:35 p.m. CT so if you’re bored at work or like us and get to say it’s part of your job check it out. Bust out the sunscreen, Luke Gregerson, you’re going to sunny San Diego. And just in time for Spring Break, too! As part of their trade for shortstop Khalil Greene, St. Louis sent the right-handed pitcher to the Padres on Monday. Gregerson was selected as the player-to-be-named in the December 4, 2008 deal, which initally sent right-handed pitcher Mark Worrell to San Diego. The Cardinals 2006 draft pick posted a 7-6 record with 10 saves and 3.35 ERA in 57 relief appearances for Double-A Springfield in 2008.